Available only from Ethics Solutions® , this concise, revealing handbook helps you explore the fascinating but forgotten world of ethics. Ethics is not just a list of rules. The handbook teaches that it is a system of thinking. Estimated reading time for a person with an eighth grade reading ability: two hours. The handbook includes but is not limited to a compilation of the ethics commonly taught in six years of schooling until ethics instruction was halted the 1960s. • Humans are profoundly social creatures. • Nearly all human relationships are based on contracts. • Precautions when making personal and business agreements. • What is ethical bedrock? • The uncountable benefits of standing on ethical bedrock. 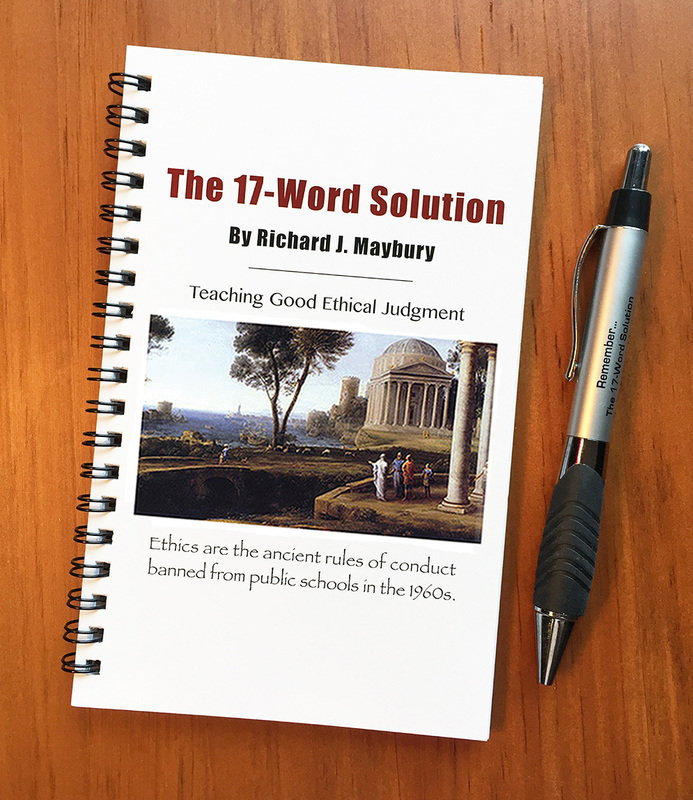 • Why schools stopped teaching ethics. • How to know if you are encroaching. • The essential elements of agreement. • Why keeping one's word is so important. • Why ethics and honor are crucial in a marriage or partnership. • What is valid consideration? • Why theft, even petty theft, is so harmful to everyone including the thief. • The hidden economic reality behind your agreements. • Why theft is the same as assault, and equally serious. • Lying is a trap, it leads one into failure and misery. • Honesty can be as rewarding as it is difficult. • The critical importance of "all men are created equal." • Why have the two fundamental laws that make civilization possible been forgotten? • Where did the two laws come from? • How can you prove scientifically that the two laws work? • Are there other laws besides the two? • How to use the two laws as tools in everyday life. • The four essential elements of a contract. • Why highly important agreements should be in writing. • The two possible ways economic activity can be organized. • Be aware of the links in "chains of agreements." • Why goldbricking is theft. • Punctuality is more important than you think. • Ambient levels of encroachment. • Money and property are frozen time. • What is a right? • Why the old saying "a man's home is his castle"? • Patents, trademarks and copyrights. • Friendliness, politeness and rudeness. • Why vulgarity and cursing are more damaging than you think. • The critical importance of restitution. • The reasonable person doctrine. • And much more, all in two hours of easy, enjoyable reading with lots of easy-to-remember examples.